Okay, so I marched in the San Francisco antiwar demonstration, October 26th, against my better judgement: and I'm glad I did. I did it because this was considered a test of antiwar sentiment, and I felt obligated to attend, but I had a good time in spite of myself. It was a colorful crowd, as befits Baghdad-by-the-Bay, it was a nice day, and the people marching alongside us were pretty cool, with their spirited music and colorful banners. But then came the speeches, and, omigod, a more stereotypical collection of leftie bromides has never been heard before or since. On and on they droned, but my ears really pricked up when someone – I didn't catch who – started ranting from the stage about how the organizers of the rally had "received criticism" from "reactionaries" about the multi-purpose multi-issue multi-culti nature of the march: but, oh no, these guys weren't about to stick to "one single issue" (i.e. a murderous war against a nation that has never attacked us) because … well, just because, that's why. So there! Pathetic. Perhaps that little tirade – and, to be honest, I didn't catch all of it – was in response to a couple of articles in Mother Jones magazine, by Todd Gitlin, Geov Parrish, and myself, criticizing just this aspect of the demonstrations. Or, perhaps not. At any rate, the Commies in charge of the demo weren't about to brook any criticism of either their ideology or their methods: this was the only show in town, and they weren't about to give it up. I ran into the heroic Maad Abu-Ghazalah, running for Congress in California's Twelfth District against rabid warmonger Tom Lantos (a Democrat, naturally): he was trying to get a spot on the speakers' list, to no avail, of course. No Libertarians need apply. "'The required ingredient to [the American] system was terror and war,' said activist John Parker. 'It's the system of capitalism, and in this stage is a system called imperialism. It means you compound more and more wealth in fewer and fewer hands, which means you need more and more terrorism and war.'" But if that's true, then it doesn't matter how many hundreds of thousands are mobilized to stop this war before it starts, because "the system" produces war like a widget factory produces, uh, … widgets. So this is the analysis of the sponsors of October 26: short of overthrowing capitalism, no effective anti-imperialist movement can reverse our foreign policy of global military intervention. Never mind that capitalism – free markets – is the antithesis of war, that the stock market takes a long dive every time Bush utters a war cry, and that war, as Randolph Bourne put it so succinctly, "is the health of the State." If you're a dogmatic leftie talking though your hat to other dogmatists, it doesn't matter what you say, as long as it doesn't make the least bit of sense. The people who came to these demonstrations – 100,000 in Washington – don't share the politics of the organizers. Indeed, there aren't many people on earth – save in North Korea – who share the politics of the organizers. I won't go into a long tirade about those politics – the "International A.N.S.W.E.R." "coalition" is, in reality, a front for a group of particularly kooky leftists, the Workers World Party, which is a parody of the typical leftist "revolutionary," group, circa 1936. (For more info, go here, here, here, here, here, and here). "We anticipate we may hear and be considered in the same boat as some whose rhetoric is really hostile and anti-American. We are not anti-American. We are anti-war." "I do not like being associated with these people. Some of them are more anti-American than anti-war." Amen, brother! That just about sums it up, as far as the leftist-led antiwar movement is concerned. The movement has been hijacked by a bunch of neo-Stalinists, who, oddly enough, utilize their hopped-up "radical" rhetoric in the service of the most conventional Democratic party politics imaginable. Doesn't anyone see the humor in Barbara Lee calling for a Democratic election-year sweep from a platform erected by those who mourned the fall of the Berlin wall? You should've seen all those nose-ringed bandanna-ed "anarchist" kiddies applauding Lee as she hustled votes for Democrats and assured us that only the UN has a legitimate right to declare war on Saddam Hussein. It was a revealing moment, and a truly disgusting sight. I was going to stay longer, and listen to all the speeches, but unfortunately there weren't any: not really. Representatives of a long list of "multicultural" groups – Concerned Lesbians of Color (Differently-Abled Caucus), the United Transgender Revolutionary Alliance (Marxist-Leninist) (also known as Untrammeled! ), and, of course, the National Victimological Congress of Egalitarian Idiotarians – shouted slogans into the microphone, which the hopped up lefties near the stage shouted mindlessly back, like teenagers at a school pep rally. Here, at this solemn moment, as the nation teeters on the brink of a disastrous war, and rational arguments are called for, what do we get? Rah rah, sis-boom bah! Hooray for us, and [expletive deleted] the rest of the country. "But these groups will need to get organized if the peace movement stands any chance of forcing the government to rethink its policies, said Peter Wirth, a media consultant in Syracuse, N.Y., who works with social justice groups. Peace groups need to send a simple, focused message to rally the public's support and not let the issue get linked to other causes, he said." "'The White House is carefully choosing its message, symbols and spokespeople to make sure they reach middle America. A handful of people in the streets - and even if 100,000 show up in D.C. - that is still a handful, will not stop the war. Unless we reach out to veterans, Democrats, Republicans, Rotary members, waitresses, the folks who bowl on Saturday night, the 99 percent of people in our community who will not show up at any of our events, in addition to us peace activists, we will fail." In short, the antiwar forces, if they are to stop this war before it starts, or even to raise significant questions in the minds of most Americans, must recruit the hated bourgeoisie – the object of the leftists' eternal scorn. The leftist grouplets that control both major "coalitions" – "Answer" and "Not In Our Name"  are not interested in building the antiwar movement, per se, so much as building their own little parties, and recruiting marchers in their next demonstration to free the convicted murderer and professional left-wing martyr Mumia abu-Jamal. And they lack the tactical ingenuity of their Communist Party USA ancestors, who at least had the good sense to come up with some counterintuitive but resonant slogans such as "Communism is 20th Century Americanism"! On the other hand, I don't want to be too hard on Ramsey Clark and Workers World. Although I've had to deal with their goon squads on several occasions over the years, I have to say that Todd Gitlin's critique of their politics is half red-baiting and half-cocked. He doesn't like going to demonstrations and seeing "radical" signs like "stop the sanctions." He's for sanctions, you see – it's okay to starve the children of Iraq, but just don't bomb them and put them out of their misery too soon. Sheesh! Compared to Gitlin, Pat Buchanan, the alleged "reactionary" and hate-figure of the Left, is a veritable pussycat when it comes to the sanctions issue, which he has several times denounced as "barbarous." And that other bete noire of the Marxoid Left, as well as all-too-many libertarians, organized religion, is also guilty of "radical" sentiments: not just the liberal Protestant National Council of Churches, but also the Roman Catholic Church, and the Pope himself, have come out foursquare against the sanctions as morally impermissible. "Why and whether an American war against Iraq would be good for Israel is far from clear and is the subject of vigorous debate in Israel itself  but not in America. Theories range from the mundane to the exotic to the paranoid: Clearing out a neighborhood troublemaker before he gets the bomb is reason enough. Or, deposing Saddam will set off a complex regional chain reaction that will somehow turn the Arab nations into peaceful bourgeois societies. Or, Prime Minister Ariel Sharon actually wants a huge regional conflagration that he can use as an excuse and cover for expelling the Palestinians from the West Bank. In any event, the downside risk for Israel  of carnage, military and civilian  is like America's, only far greater. "But we'd better not talk about it." Why not? Because, says Kinsley, it conjures up "classic anti-Semitic" images of "the President's Jewish advisors whispering in his ear." Gee, I didn't know Karl Rove was Jewish. For while Kinsley mentions Rove, as well as Richard Perle and deputy defense secretary Paul Wolfowitz, he doesn't give the former his due: for it is Rove, and not the others, who is driving the President's decision-making process this election year. The politics of this war reflect the internal politics of the Republican party, which demand unconditional support for Israel as a matter of political faith. But this faith is not Judaism: it has nothing to do with "Jewish advisors" and everything to do with the enormous influence of Christian fundamentalists of a certain sort in the GOP. The "dispensationalist" Christian evangelicals, who believe that human action can influence and even cause the Second Coming of Christ, are theologically wedded to Israel – and they make up the organizational backbone of the President's political base, which must be appeased at all costs. They believe that when all the Jews are gathered in the land of Israel, His coming is imminent – and so they are self-proclaimed "Christian Zionists" whose fervor has made Zionist groups both grateful and uncomfortable. Grateful for the political and material support, and discomfited by the idea that these are people who believe that, in the Final Days, all Jews will either convert or be banished to the nether regions. "Tariq Aziz has a theory. Saddam Hussein's deputy told the New York Times this week, "The reason for this warmongering policy toward Iraq is oil and Israel." Although no one wishes to agree with Tariq Aziz, he has put succinctly what many people in Washington apparently believe. They do not think the concern over potential use of nuclear, chemical, and biological weapons is negligible or insincere, but they do think that 'oil and Israel' is a pretty good summary of what, for President Bush, makes Iraq different from your run-of-the-mill evil dictatorship. Yet this presumption about Bush, and these issues themselves, barely appear in the flood of speculation and argument about Bush War II." Gitlin spreads his poisonous red-baiting and backbiting via another article on the antiwar movement's dilemma in Salon.com, which retails his smearing of the "Not in Our Name" project. According to Salon, NION is linked to a group called "Refuse and Resist," which is, in turn, somehow linked to the Revolutionary Communist Party, a group of pro-"Gang of Four" Maoists. The group was founded in the 1970s by Bob Avakian, the Great Helmsman of the radical Maoist faction, who fled to France after a demonstration at the Chinese embassy resulted in a string of felony charges. Directing the Great Proletarian Revolution from exile on the Riviera, Avakian is not exactly Carlos the Jackal, but if the description in Salon is to be taken seriously these folk are "supporters of the maniacally brutal Shining Path guerrilla group in Peru." Gitlin tells us of a supposed conversation with Clark Kissinger, an RCP member, who calmly informed him that, come the Revolution, opponents of the RCP would be shot. Gitlin, I'm sure, is still shaking in his boots. The story, if true, and if somebody wasn't just having a bit of fun with the pompous Gitlin, underscores why working with Kissinger and others of a similar ilk is alright with me: because they represent no real threat, either to me or to the country. As an ideology, Communism is as much a menace as phrenology or Rosicrucianism: as a movement, it can hardly be said to exist. The RCP has, at most, a few hundred members. If Kissinger and his fellows reds want to play at "revolution," and in the meantime are content to lick envelopes and do the work it takes to build a unified single-issue movement, then who is anybody to complain? Least of all Professor Gitlin, who is no doubt above licking envelopes. When some snot-nosed lap-top bombardier of the neoconservative set brings up Kissinger's commie views, the proper answer is that the antiwar movement is ideologically diverse and united around opposition to the war – period. "'If you refuse to associate politically with people on specific issues because you don't agree with their whole program, you end up very lonely and harmless,' he says, noting that he'd also be willing to march with Patrick Buchanan, another opponent of the war in Iraq whose politics he fiercely disagrees with." I have a dream. 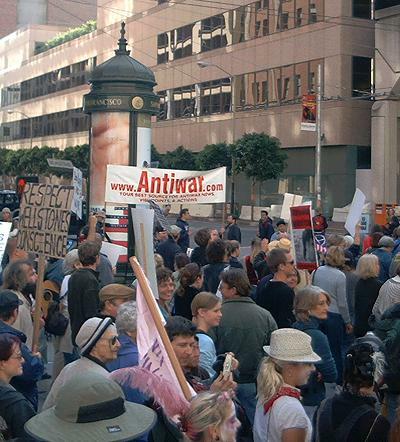 It is an antiwar rally that features not only the Usual Suspects, but also some that are quite unusual, at least speaking from the platform at an antiwar demonstration. Let Ramsey Clark speak, let Rep. Barbara Lee have her moment in the spotlight, but let them share it with Pitchfork Pat and Rep. Ron Paul, one of the few Republicans to vote against this war and the most principled and consistent opponent of foreign interventionism in the U.S. Congress. To borrow a phrase from the history of the Chinese Communist Party, with which I know the partisans of the RCP and Workers World will be familiar: "Let a hundred flowers bloom!" "Against the insidious wiles of foreign influence (I conjure you to believe me, fellow-citizens) the jealousy of a free people ought to be constantly awake, since history and experience prove that foreign influence is one of the most baneful foes of republican government. But that jealousy to be useful must be impartial; else it becomes the instrument of the very influence to be avoided, instead of a defense against it. Excessive partiality for one foreign nation and excessive dislike of another cause those whom they actuate to see danger only on one side, and serve to veil and even second the arts of influence on the other. Real patriots who may resist the intrigues of the favorite are liable to become suspected and odious, while its tools and dupes usurp the applause and confidence of the people, to surrender their interests." That's from George Washington's Farewell Address, in case you don't recognize it, which the "A.N.S.W.E.R." group would never even consider putting on its website. After all, Washington was from the oppressor class, one of those dreaded Dead White European Males. Yet his warning to the future, if Americans could be awakened to its implications for today, bears repeating. And, unlike the stereotypical rhetoric of the Commies, it has the power to mobilize millions. When oh when will the antiwar movement realize this – and will they do so before it's too late? "ANTI-WAR BIGOTRY WATCH: 'What is 'self-evidently bizarre,' however, is that Sullivan seems to be publicly losing his mind. It happens to a lot of people with AIDS. Dementia sets in, eventually, and, no matter how many drug cocktails they take, in the end virtually all succumb to mania and mental deterioration.'  gay Buchananite polemicist Justin Raimondo, Anti-War.com, setting a new level of discourse for the anti-war movement." Let's see if I get this, er, straight: It's okay for Sullivan to attack opponents of a war that serves Israel's interests, but not our own, as "anti-Semites," and it's perfectly alright for him to publicly hallucinate that antiwar activists are handing out copies of the Protocols of the Elders of Zion (oh, puh-leeeze!). But it's not okay to point out an indisputable medical fact: that people with AIDS do indeed suffer from dementia. Sullivan, of course, has not exactly kept his AIDS diagnosis a secret: indeed, he has written an entire book on the subject, as well as several articles. Yet we are supposed to believe that it is "bigotry" for another self-identified homosexual to link Sullivan's deluded rhetoric to his medical condition. For all his bitching about the supposedly horrendous "gay Left," it's very telling how quickly Sullivan reverts to the classic "I'm a victim" stance of his leftie brothers-in-spirit. Earth to Andy: get over it, Mary. You sure can dish out the lies, but can't take truth even in small doses. Tough.